You are invited to a walk to the city boundary. Activities include the seminar and a fieldwork to Mount Davis. Dr Chan is currently an Honorary Assistant Professor in HKU Department of Geography, and Assistant Professor in Department of General Education at Hang Seng Management College. He is passionate in teaching and sharing with students. His research interests are focused on Hong Kong issues, including Urban Development Studies, Historical and Cultural Studies, Cultural Tourism and Heritage Management in Hong Kong. Limited quota, first come first served. 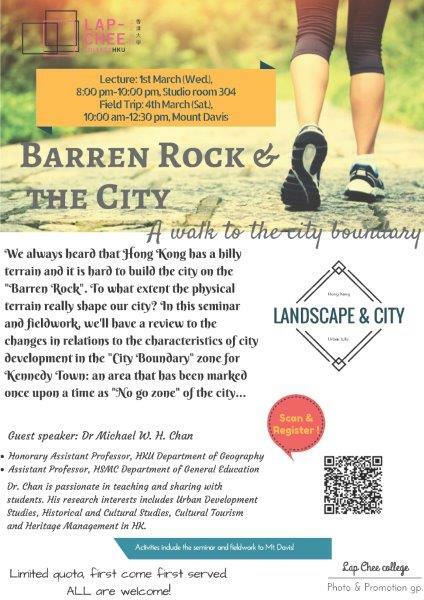 This event is open to all Jockey Club Student Village III residents and members of the HKU community. The field trip is supported by a coach to and from the College. For enquiry, please contact the organizing tutor: crystal0@hku.hk (Crystal Lee).